DJI says smartphone users will be able to shoot smoother, more cinematic video with a new handheld gadget that packs video stabilization technology used on the company's drones. 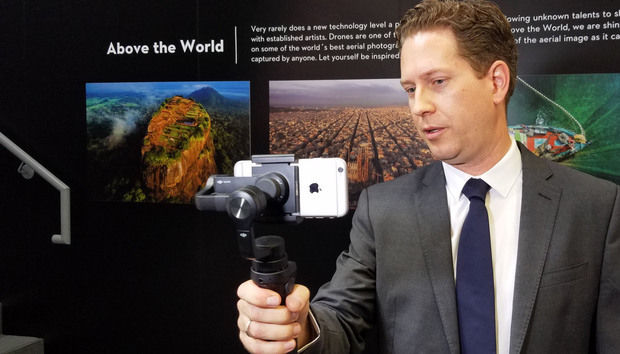 The Osmo Mobile, which was announced at the IFA trade show in Berlin on Thursday, combines a three-axis camera gimbal with a larger handle and smartphone mount. In a demonstration, the device indeed produced much smoother shots than when shooting smartphone video handheld. And I could tell it was working to keep the smartphone steady because I could feel a low-level vibration in the handle while using it. It was the gimbal continuously readjusting to compensate for shakes and small movements of my hand. DJI's Osmo Mobile smartphone stabilization gimbal on show at IFA in Berlin on September 1, 2016. It's similar to DJI's Osmo, a handheld video gimbal with an integrated camera that was launched last year, but it may come as a surprise to people who know DJI better for its Phantom series of drones. Those drones are largely used for photography, and the company said it spends a lot of time working on camera mounts for smooth photography. The Osmo Mobile has several basic modes. One keeps the camera steady as you point and shoot, another is designed to track your face for selfie videos, and yet another will smoothly pan the phone while taking photographs for a better panorama shot. There's also a mode for low-angle shots that will keep the camera pointing upward as you hold it down toward the ground. The device is controlled through an app called DJI Go and it runs on both Apple iOS and Android phones. The smartphone holder is large enough to grip some of the largest phones on the market, including the iPhone 6 Plus, Samsung Galaxy Note 7, and Huawei Mate 8. Through the DJI app, the video can also be live streamed. The device went on sale on Thursday and will cost $299 in the U.S., £289 in the U.K., and €339 in the rest of Europe. A new version of the Osmo device with an integrated camera was launched by DJI last week. The new Osmo+ includes a 7x zoom on the camera and a similar gimbal system to the Osmo Mobile. At $649, the Osmo+ with a camera costs considerably more than the Osmo Mobile.